The project began last year with one hundred books. 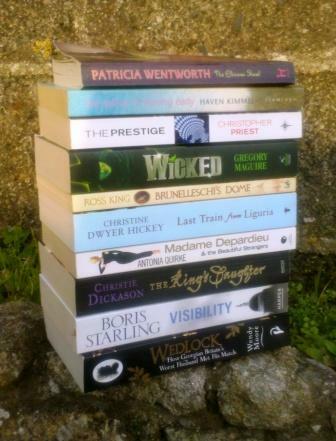 By the end of the year forty books had left the premises last year, and so I’m adding forty more for 2012. I’m introducing the books ten at a time, and so here are the final ten to make up the hundred I’m going to draw on. Do let me know if I have a book that you’ve loved and I’ll try to make it a priority. Or a book that you’ve hated and I should think twice about. Tanis Lyle was one of those passionate women who always get their own way. Her cousin Laura hated her. Most women did. But men found her irresistible and she used them mercilessly. So when Tanis was found murdered there seemed to be any number of suspects on hand. But Miss Silver had her own suspicions . . .
A mystery author from ‘my period’ I had yet to try, so when this one turned up on a charity shop sale table I picked it up. Langston Braverman returns to Haddington, Indiana (pop. 3,062) after walking out on an academic career that has equipped her for little but lording it over other people. Amos Townsend is trying to minister to a congregation that would prefer simple affirmations to his esoteric brand of theology. What draws these difficult—if not impossible—people together are two wounded little girls who call themselves Immaculata and Epiphany. They are the daughters of Langston’s childhood friend and the witnesses to her murder. And their need for love is so urgent that neither Langston nor Amos can resist it, though they do their best to resist each other. I think I bought this at the lovely Any Amount of Books in Charing Cross Road back in the days when I worked just around the corner in Cranbourn Street. Which means I’ve had it for a very long time. I’ve started a couple of times and I’ve liked it but not been sufficiently engaged to keep reading. So next time it’s finish or ditch! Two 19th century stage illusionists, the aristocratic Rupert Angier and the working-class Alfred Borden, engage in a bitter and deadly feud; the effects are still being felt by their respective families a hundred years later. Working in the gaslight-and-velvet world of Victorian music halls, they prowl edgily in the background of each other’s shadowy life, driven to the extremes by a deadly combination of obsessive secrecy and insatiable curiosity. At the heart of the row is an amazing illusion they both perform during their stage acts. The secret of the magic is simple, and the reader is in on it almost from the start, but to the antagonists the real mystery lies deeper. Both have something more to hide than the mere workings of a trick. I loved the film and I was curious about the book, which I had heard was quite different. So I picked up a copy on ReadItswapIt. An astonishingly rich re-creation of the land of Oz, this book retells the story of Elphaba, the Wicked Witch of the West, who wasn’t so wicked after all. Taking readers past the yellow brick road and into a phantasmagoric world rich with imagination and allegory, Gregory Maguire just might change the reputation of one of the most sinister characters in literature. There was a time when this book was everywhere; I wanted to see what all the fuss was about, so when I spotted a copy in a charity shop I picked it up. Filippo Brunelleschi’s design for the dome of the cathedral of Santa Maria del Fiore in Florence remains one of the most towering achievements of Renaissance architecture. Completed in 1436, the dome remains a remarkable feat of design and engineering. Its span of over 140 feet exceeds St Paul’s in London and St Peter’s in Rome, and even outdoes the Capitol in Washington DC, making it the largest dome ever constructed using bricks and mortar. The story of its creation and its brilliant but “hot-tempered” creator is told in Ross King’s delightful Brunelleschi’s Dome. I read a historical novel set in Florence – I think it was one of Sarah Dunant’s – and it made me want to read about the real history. I asked on for recommendation LibraryThing, this book was mentioned, and so I acquired this copy. I forget where it came from. I bought this new – the synopsis made me think of wonderful books by Kate O’Brien and Maura Laverty, which has to be a good thing. ‘Madame Depardieu and the Beautiful Strangers’ is the story of how a young female film critic’s love-life is affected and nearly ruined by her obsession with male movie stars. As her increasingly hapless hunt for the right man unfolds and her television and newspaper career unravels, our heroine finally begins to understand that difficult truth: that life is not like the movies. Entwined with the narrative of her real-life love affairs is a kaleidoscope of digressions on great screen actors — her dream-life with Gerard Depardieu, a personal ad seeking out Tom Cruise, a disastrous climactic encounter with Jeff Bridges. It’s a helter skelter ride through love and the movies which reads like a screwball comedy. And the screwball is our heroine, who seems to know everything about movies and the human heart, and nothing about anything else. An impulse buy in a charity shop – the title intrigued me, I had to take a look, and once I’d looked I had to bring the book home. As First Daughter of England, Elizabeth seems to live a life of privilege and luxury. Yet she is imprisoned by duty; a helpless pawn in the political machinations of her father, James I. She trusts only her beloved brother Henry until she is sent a slave-girl, Tallie, who becomes her unlikely advisor. As their friendship grows, the innocent Elizabeth must learn to listen to dangerous truths about her louche father and his volatile court. Can she risk playing their games of secrecy and subterfuge in order to forge her path to love and freedom? Tragically robbed of Henry in mysterious circumstances, Elizabeth must summon all her resilience and courage to determine her own future. As a stream of suitors are invited to court, her father’s unpredictability and the unstable political climate threaten to destroy her one chance for happiness and perhaps even her life. I’d seen this in the library, I meant to borrow it one day, but then I saw a copy in a charity shop and I couldn’t resist. London, 1952. As the fog rolls in, the chase begins… A stranger’s approach offering highly sensitive information seemed routine to an ex-spy turned policeman. But when a body turns up instead of state secrets, Detective Inspector Herbert Smith finds himself in a race against time to solve the murder. For he is not the only one after the dead man’s secret. It seems the CIA, KGB and MI-5 are all vying to get to the truth first and some are prepared to kill for it. As the Great Smog descends on London, bringing chaos and death, Herbert finds himself facing one of the greatest evils of the twentieth century. At stake is the biggest prize of all: the key to life itself. I think I picked this one up in Waterstone’s on a day trip to Truro. Wedlock is the remarkable story of the Countess of Strathmore and her marriage to Andrew Robinson Stoney. Mary Eleanor Bowes was one of Britain’s richest young heiresses. She married the Count of Strathmore who died young, and pregnant with her lover’s child, Mary became engaged to George Gray. Then in swooped Andrew Robinson Stoney. Mary was bowled over and married him within the week. But nothing was as it seemed. Stoney was broke, and his pursuit of the wealthy Countess a calculated ploy. Once married to Mary, he embarked on years of ill-treatment, seizing her lands, beating her, terrorising servants, introducing prostitutes to the family home, kidnapping his own sister. But finally after many years, a servant helped Mary to escape. She began a high-profile divorce case that was the scandal of the day and was successful. But then Andrew kidnapped her and undertook a week-long rampage of terror and cruelty until the law finally caught up with him. I must confess that I saw this in the library, thought I must borrow it when I had some space on my ticket, and then I realised that I had a copy at home. Another book from Waterstone’s in Truro I think. Any thoughts on this batch? It brings me up to one hundred books again, so now I must update the project page. And I’m going to report every ten books. 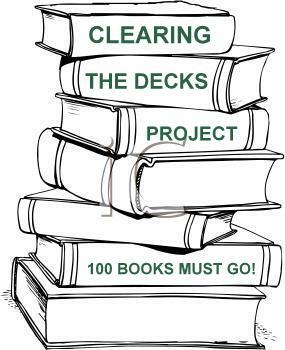 Quarterly reporting didn’t work last year, and I’ve noticed that I have three projects involving one hundred books – Clearing The Decks, Filling The Gaps and A Century of Books – so I’m going to take stock on each one every ten books. Again, I haven’t read any of them, but I have heard great things about Wicked from blogging friends who’s taste I trust. I’d at least read it before deciding to get rid of it. I have Wedlock by my bed at the moment, part started, it is one of my challenges for this year to perhaps finish it. It has fairly good reviews. I also have Last Train on my kindle again another one I have not started! It was free so it can stay on there. I hope you do well with this, 10 and 100 seem to be good numbers for you! I haven’t read any of them but The Prestige intrigues me. I’m a Patricia Wentworth fan but can’t say The Chinese Shawl is her best. A good quick read tho’ with some light detection and a spot of romance. I enjoyed Last Train very much, I know some people loathe Christine Dwyer Hickey’s style of writing but I love it. We read Boris Starling’s Messiah for our book group and after that I wouldn’t have another of his books in the house – it was revoltingly violent. I’ve got Wedlock but haven’t read it yet, somehow the moment never seems right. I loved Brunnelleschi’s Dome. I don’t know how to spell it, but I loved it. Thank you – it’s great to have another recommendation. I don’t know why it is but I enjoy reading about the books you’re getting rid of. This time the Last Train From Linguria caught my attention and I headed straight to the Kindle story and bought it. It ‘s like seeing books in used-book stores. They always seem more attractive. Wicked is wonderful, its one of my favourites.